CL28MA model is discontinued. Please talk to our Sales team for replacement details. Combination milliamp simulator and meter has numerous pre-programmed operating modes making this a versatile and time-saving instrument. It has user-programmable setups backed up with non-volatile memory for repeated special tests. Both the simulation and measurement modes operate with external loop power supplies or with an internal 24 V power source. 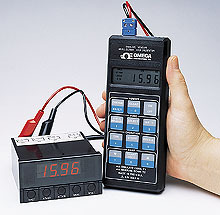 The CL28MA can be programmed with either mA or percent-of-scale data. When operating, the unit can toggle between mA or percent modes with the touch of one button. Instead of fuses, the CL28MA is protected with PTC resistors. These devices automatically reset when a fault condition is corrected. Protection is provided between any combination of terminations in the input and output connectors. Nota: Supplied with calibration cable, 9 V battery, carrying case, NIST Certificate, protective rubber boot and complete operator’s manual.